This is great news for those of you who couldn't make it to those twice a month Elevation restocks, this brand is now carried at Llarowe. Lake Achit was pretty consistent to what I've come to know about Elevation's formula. I had to do a bit of dabbing, and separate or move the glitters around with the brush to achieve this look. However, ti was well-packed with glitter so it only needed one coat, and no double dipping. 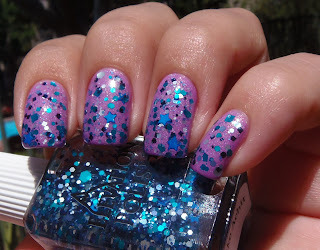 I liked this combination of blues and the different shapes of glitters, especially the stars. Lake Achit goes well over light pastel or neon colors.